UC San Francisco researchers have engineered a molecular “on switch” that allows tight control over the actions of T cells, immune system cells that have shown great potential as therapies for cancer. 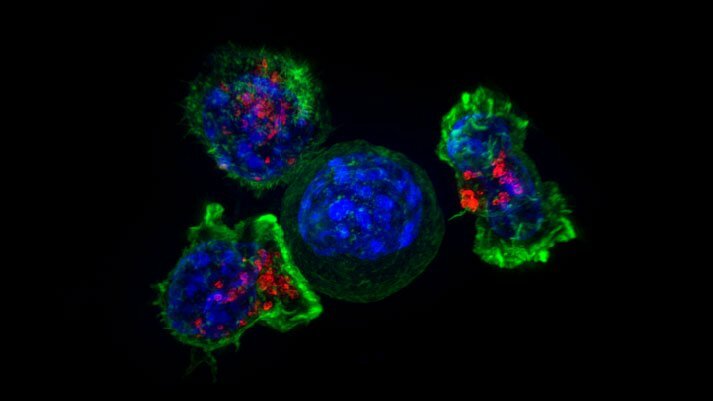 The innovation lays the groundwork for sharply reducing severe, sometimes deadly side effects that have been a significant hurdle to advancing T cell-based treatments. Over the past two decades, scientists pursuing cell therapy, one branch of the burgeoning field of cancer immunotherapy, have been refining cell-surface sensors known as chimeric antigen receptors, or CARs. Once inserted into T cells, CARs prompt these cells to home in on particular proteins found primarily in tumors, where they launch a series of cancer-killing immune responses. CAR-equipped T cells have proven to be remarkably successful in the treatment of various forms of chemotherapy-resistant leukemia. But CAR T cell therapy can cause side effects so serious that they may require monitoring in an Intensive Care Unit – several patients have died after receiving CAR T cells or other forms of engineered T cells. The UCSF team, led by first author Chia-Yung Wu, PhD, a postdoctoral fellow in Lim’s laboratory, took the opposite approach, creating a new type of CAR T cell that is “off” by default. Like conventional CAR T cells, these newly developed T cells will navigate toward and interact with cancer cells, but will not launch any immune assault unless a specially designed drug has been administered. This controller drug forms a chemical bridge between components inside the CAR T cells, flipping the cells into an active, “on” status. When the drug is no longer present, the T cells revert to an “off” position. The power of the new system is vividly illustrated in videos taken by the researchers through microscopes. In a laboratory dish containing cells expressing a protein called CD19, which is characteristic of cancer cells, the newly engineered T cells are seen to move quickly toward those cells, but “like a trained dog,” in Lim’s words, “they hold onto the cell, and don’t do anything else.” Once the controller drug is added to the dish, however, the CD19-expressing cells are killed off, one by one, by the T cells. Similar results were seen when leukemia cells were implanted into mice. These cancer cells were powerfully and selectively eliminated by the Lim group’s new CAR T cells, but only after the controller drug had been administered. The drug-based remote control system devised by Lim and colleagues does more than merely switch CAR T cells between “on” and “off” states. It can also act like a rheostat: the dosage of the drug precisely regulates the level of the T cells’ immune activity. These combined control capabilities could be employed to manage the various side effects of CAR T therapy. For CAR T cell treatments, T cells are removed from a patient’s blood, genetically engineered to carry CARs that target the patient’s tumor, then reinserted into the bloodstream to exert their effects. Once inside the body, in addition to attacking tumors directly, CAR T cells, like all T cells, release signaling molecules called cytokines, some of which recruit additional T cells to fight the tumor. Sometimes normal cells express small amounts of a cancer-associated protein targeted by a CAR T cell. Because CAR T cells placed in the bloodstream pass immediately through the heart and lungs, these tissues can be damaged before the CAR T cells reach their intended target elsewhere in the body. The control offered by the Lim laboratory’s new cells would allow physicians to leave CAR T cells inactivated until the heart and lungs are less vulnerable to these “first pass” side effects. Even when CAR T cells attack only their correct target cancer cells, side effects can still occur. In tumor lysis syndrome, the body is overwhelmed by toxic substances released when many tumor cells die in rapid succession. Another side effect, known as a “cytokine storm,” is a life-threatening vicious cycle in which released cytokines summon numerous T cells to the tumor, then these newly arrived T cells release their own cytokines, and so on. By “dialing in” the level of immune response using appropriate dosages of the controller drug, doctors may be able to precisely manage these side effects to meet individual patients’ needs. Lim stressed that the work reported in the new paper should be considered a proof of principle – while useful for experiments, the current controller drug the UCSF team used has too short a half-life to be clinically useful – but he believes that the research provides the foundation for practical remote control of CAR T cells on the near horizon. In addition to drug control of CAR T “on” switches, members of his laboratory are exploring other techniques to accomplish this goal, such as controlling CAR T cell activation with light. While successful against blood cancers such as leukemia, CAR T cells have so far shown less efficacy against solid tumors that effect the colon, breast, prostrate, brain and other tissues. The remote control strategy developed by Lim’s group may permit researchers to develop more powerful versions of CAR T cells that could attack these solid tumors, while still keeping side effects in check. Members of the Lim laboratory are also working to reduce side effects by introducing multiple CARs into T cells, so that the cells will respond to multiple characteristics that are distinctive to an individual patient’s tumor, rather than to just a single protein that may also be found on normal cells.